More likely to affect teens in their growing years, osteosarcoma symptoms are most likely in teenagers, but the disease is treatable. 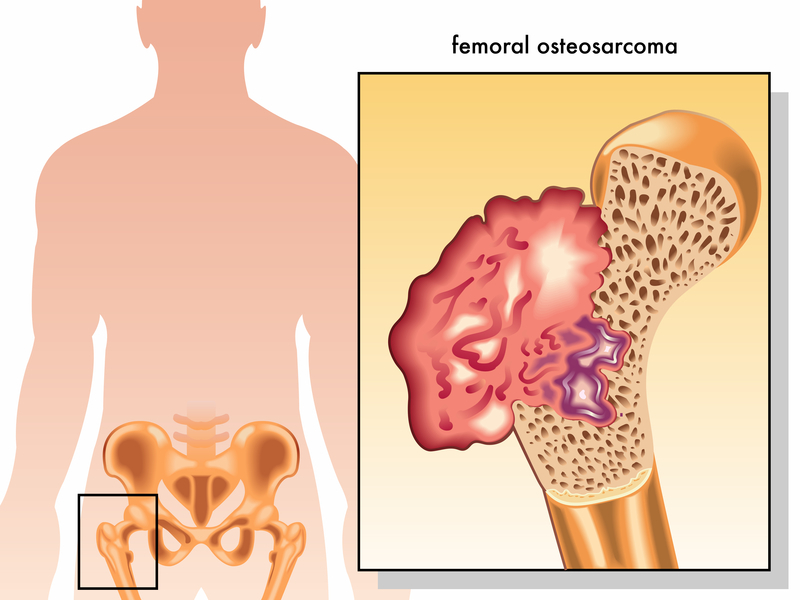 The illustration above shows a femoral bone bearing the effects of osteosarcoma. What is osteosarcoma? It’s a cancer of the bones—one of the few cancers, in fact, that actually starts in the bones, as opposed to spreading (metastasizing) to the bones from elsewhere in the body. Once osteosarcoma develops, it can spread to nearby muscles. Osteosarcoma, also known as bone sarcoma, can occur at any age, but it tends to develop during times when people are going through growth spurts. For this reason, osteosarcoma symptoms are most common in children and teenagers. The main osteosarcoma symptoms that occur with the disease are joint pain (which is likely to appear most often at night), and swelling that becomes apparent a few weeks after your child complains of pain (you also may be able to feel a lump or mass in the swollen area). If your child’s leg is affected, his osteosarcoma symptoms also may include a limp. Osteosarcoma weakens the bones, making them susceptible to fracture; often, a broken arm or leg is what leads to an osteosarcoma diagnosis. FYIOsteosaroma Symptoms and Diagnosis: Statistics in the U.S. Bone sarcomas are very rare, thankfully. According to SarcomaAlliance.com, approximately 2,890 new cases are diagnosed in the United States each year, and 1,400 deaths each year are attributed to the disease. Fortunately, osteosarcoma is treatable, and most children and teens diagnosed with this cancer do recover. Rare inherited cancer syndromes including retinoblastoma (a rare form of cancer that affects the eye), and Li-Fraumeni Syndrome (which also raises the risk for breast cancer and brain cancer). Boys who are particularly tall are more vulnerable to osteosarcoma symptoms than girls. The long bones of the arms and legs are the areas most likely to be affected—the shin and thighbone (with a tumor in the knee area, for example) and the humerus (with a tumor near the shoulder joint). Osteosarcoma is treated with chemotherapy to shrink the tumor and destroy any cancer cells that have spread. Surgery also may be performed. “Limb-sparing” surgery aims to save the affected limb, removing diseased bone and muscle and filling in these areas with bone grafts or metal components. If metal parts are used, they may have to be replaced as your child grows. Unfortunately, if osteosarcoma is advanced, the affected limb may have to be amputated. Because a child who complains of osteosarcoma symptoms is typically going through a growth spurt, you may dismiss the discomfort as “growing pains.” However, if your child persistently complains of pain and tells you it is getting worse, this may signal osteosarcoma symptoms. Consult your doctor, particularly if you have a family history of known risk factors. Originally published in December 2016 and updated. bone, bone sarcoma, brain, brain cancer, breast cancer, cancer, cancer cells, cancers, chemotherapy, children, joint pain, muscle, osteosarcoma symptoms, pain, pains, radiation, radiation treatment, sarcoma, tumor.